Saten Keshwan’s vehicle being winched out of the Wainibuka River. Christmas holidays will not be the same for Raviashni Goundar of Ba after the death of her elder brother. 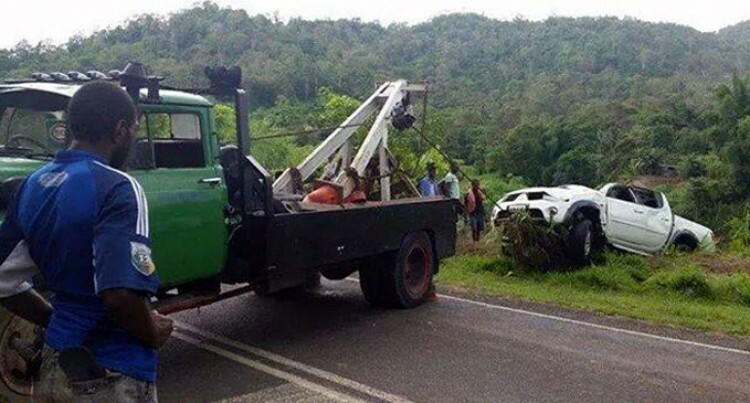 Saten Keshwan, 58, died in an accident on Saturday morning near Naqia Village, Wainibuka, on the Kings Road. Mr Keshwan was a project manager at M R Dayal and Sons Limited of Ba. He had travelled to Rakiraki to attend a meeting. Why he ended in Wainibuka has not been determined. It is believed that the four-wheel drive vehicle he was driving veered off the road before taking a plunge into the Wainibuka River. “My brother was a role model for us all and it is unfortunate that he is no longer with us,” said an emotional Ms Goundar. “He migrated to New Zealand when he was a teenager but returned to Fiji to look after our parents six years ago. She said the family members and Mr Keshwan’s wife were in a state of shock after they heard news of the tragedy. Mr Keshwan’s wife and children are expected to arrive for the funeral later this week. At this stage, the family members did not know what led to the horrific accident. Police spokesperson Ana Naisoro said Mr Keshwan was evacuated by villagers and conveyed to the Korovou Hospital where he was pronounced dead. “At this point the case has not been classified as a fatal accident as the outcome of the post mortem will determine the cause of death before the report can be classified,” she said. Ms Naisoro confirmed that there has been no progress on the case but police were working to find the cause of accident.